The Irish Eyes Slot Game takes you to the Emerald Isle for a chance to win enough gold coins to make a Leprechaun jealous. Spin the reels for two different bonuses including the Free Games Feature and Pick and Win Feature. You can win free games and prizes that multiply bets up to 100 times. 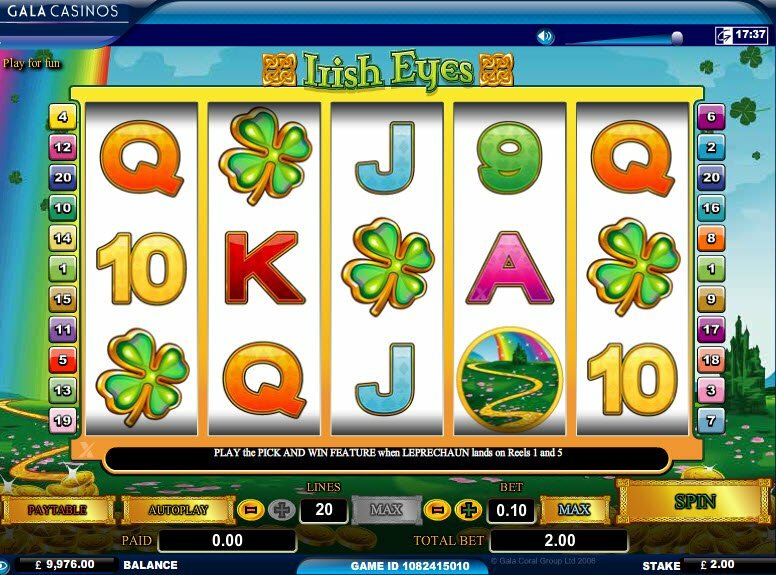 The Irish Eyes Slot Machine contains 5 reels and 20 paylines. The game has some lucrative bonus features including a chance to win free spins and multipliers. However, if you’re expecting state-of-the-art 3D graphics, then Irish Eyes just isn’t for you. Leprechauns, pots of gold, four leaf clovers, and a red-haired lass all fill the reels of this Celtic inspired slot machine. Unfortunately, the Irish Eyes Slot Machine doesn’t measure up to the standards of other online slots. The graphics seem mediocre and outdated. Even the sound effects are very simple. 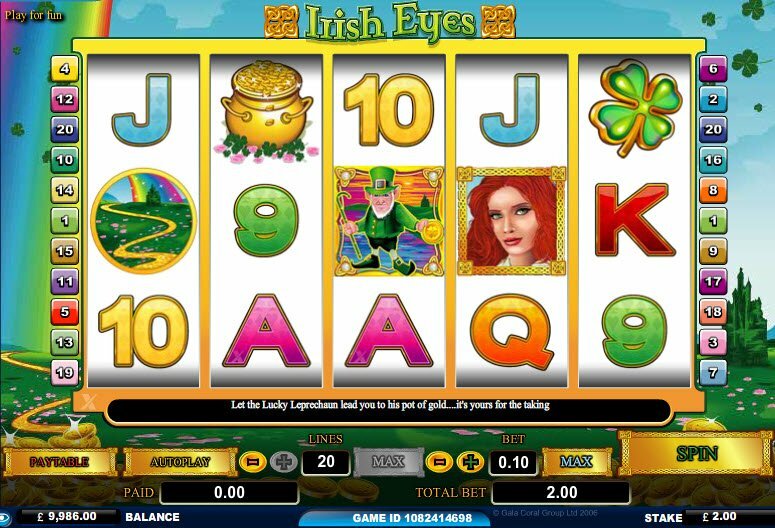 The Irish Eyes Slot contains two bonus features where you can win free spins and multipliers. Look out for the Free Games Feature along with the Pick and Win Feature. 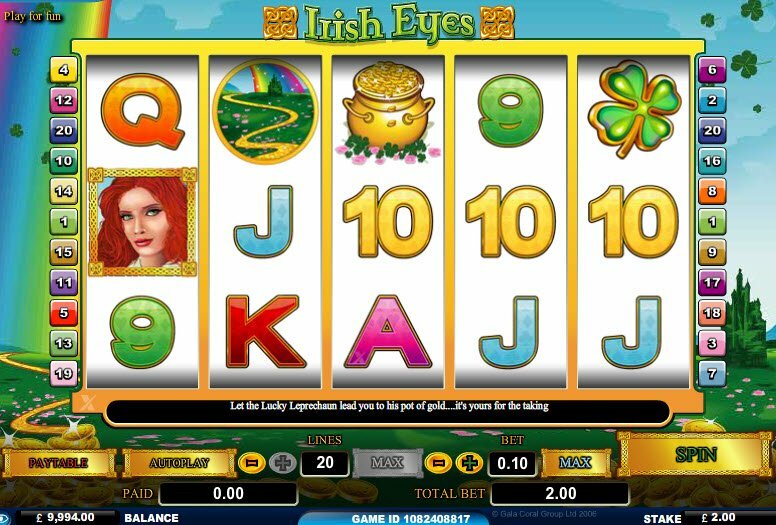 In addition the standard slot machine rules which pays out for winning combinations, the Irish Eyes Slot bonuses contains two features where you can win free spins and multipliers. Look out for the Free Games Feature along with the Pick and Win Feature. The red-haired lass represents the Scatter Symbol. When 3 or more Scatter Symbols appear on the reels it triggers a free game. During this Free Games Feature, you win 12 Free Games during which all prizes triple the payout amount. The Leprechaun substitutes for all symbols except the Scatter Symbol. When the Leprechaun appears anywhere on Reels 1 and 5 at the same time, the game awards the Pick and Win Feature. During the Pick and Win Feature, you pick one of the triggering symbols to reveal a prize where you can win up to 100 times your triggering bet. Thanks for the heads up Jason! We appreciate it! Again, though – it’s NextGen powered but the software provider is Microgaming. Cheers.